Wow! 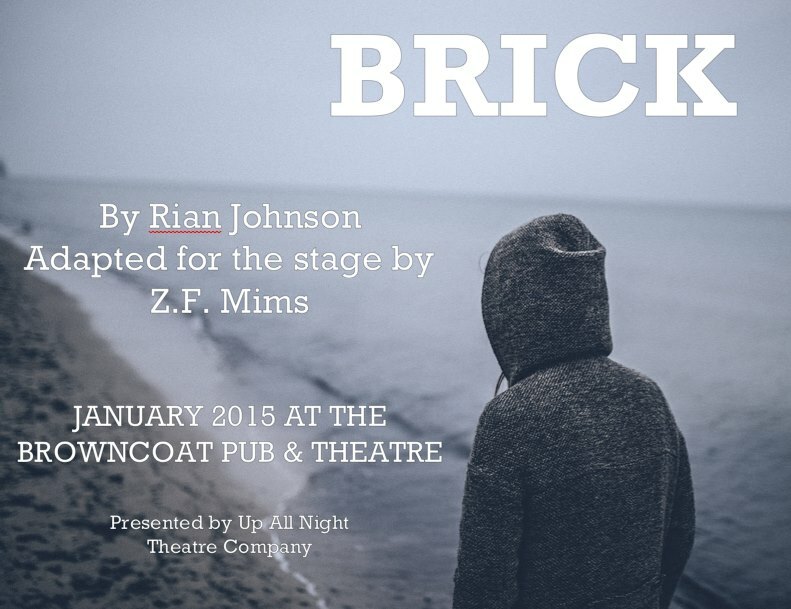 Brick opens tomorrow (Thursday, January 8th) at 8pm at the Browncoat Pub & Theatre! To make things even cooler, Rian Johnson, the screenwriter and director of the original film, sent us a fantastic tweet of good luck! In addition, encore and Star News wrote some fantastic preview articles for us – make sure to check them out! Teenage loner Brendan receives a mysterious call for help from his ex girlfriend, who quickly vanishes without a trace. As he investigates her disappearance, Brendan finds himself wrapped up in a high school crime ring. Everybody’s got an angle. Who can Brendan trust? 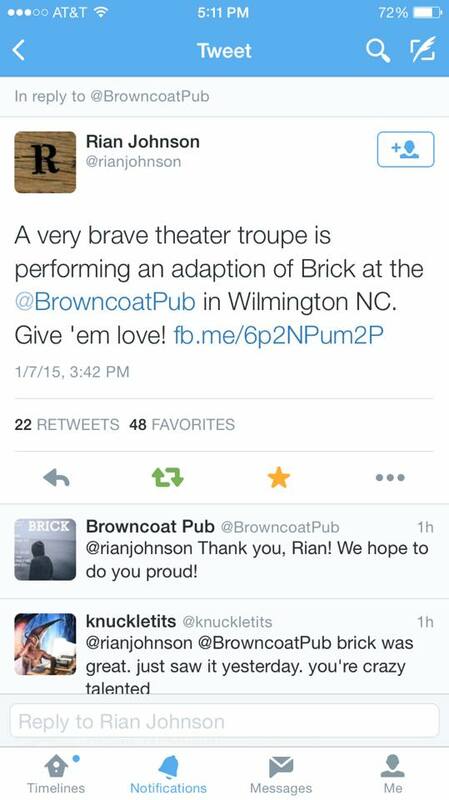 Join Up All Night and the Browncoat Pub & Theatre for this original adaptation of the first full length feature by filmmaker Rian Johnson. Johnson has gone on to direct “Looper” and will direct two of the upcoming “Star Wars” films. We are very excited to be adapting it for the stage, exactly a decade after it first premiered at Sundance Film Festival. We are looking for actors age 18+. Characters are largely late teens to early 20’s in age, but some are slightly older, approaching mid 30’s. Auditions will consist of a cold read. Resumes and headshots appreciated but not required. Auditions are 7-9pm on both Monday, Nov. 17th and Tuesday, Nov. 18th. Callbacks are during the day on Saturday, Nov. 22nd at the Browncoat. Brendan: Male, A loner, dark and brooding. Not one for conversation, but suave when it serves his purposes. This part is monologue-heavy, so be prepared for lots of memorization if cast in this role. Emily: Female, Tragically beautiful. “Too much makeup, not enough sleep.” World-weary and weak, yet gorgeous. This character has few lines, but is often seen onstage without speaking, so we are looking for physical expressiveness. The Brain: Male, Dr. Watson to Brendan’s Holmes. Matter-of-fact and occasionally disapproving. This part will be largely done in voice-over. Kara: Female, pure seduction and manipulation. This part plays heavily into the “femme fatale” trope. Laura: Female, mysterious, but with an air of trustworthiness. She seems to be in on everybody’s deepest secrets. Dode: Male, A hopeless romantic with a strong “Knight in Shining Armor” mentality. Strong of heart but weak of mind and body. Tug: Male, big and strong. Not necessarily stupid, but nor is he a manipulative genius. A temper like a powder keg that could be set off at any moment. Pin: Male, aloof, dark, with a manufactured air of mysteriousness. He has a carefully crafted facade meant to intimidate others and hide how weak he truly is. Beyond these core 8 characters, we are looking for a handful of ensemble members to play various smaller roles in the show. 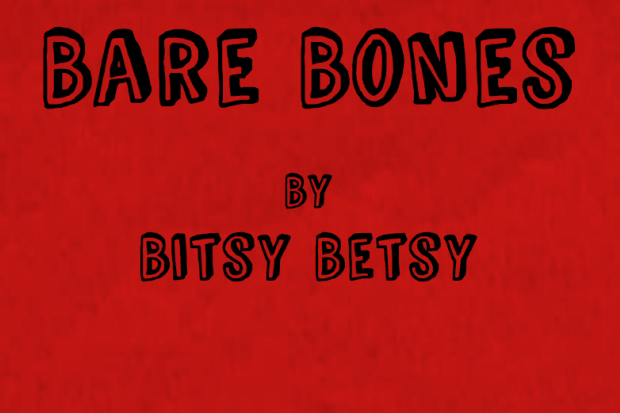 Thanks to all of your generous donations and the hard work of our cast and crew, we are proud to present Bare Bones, directed by Naomi Barbee and written by Bitsy Betsy. 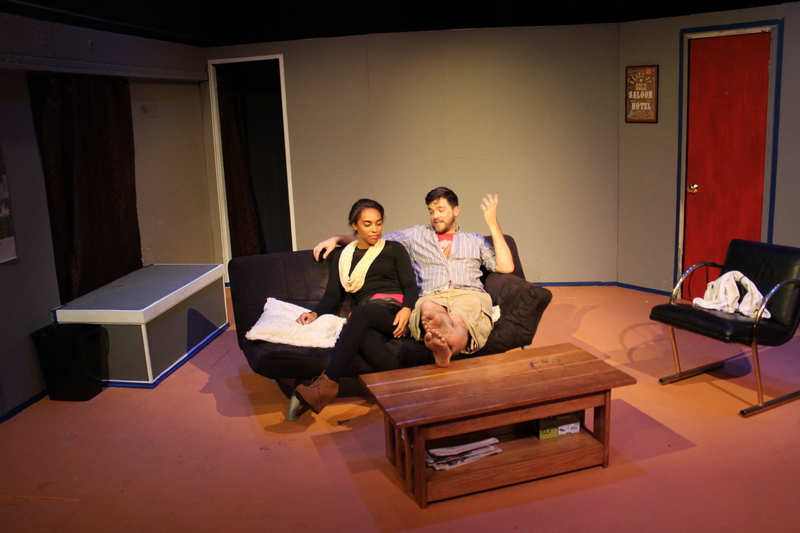 The play examines and explores the mental and emotional state of a young woman as she goes through an eating disorder. As she experiences this, we get to see how it affects not only her, but also the people around her. As the story progresses we truly see what it is for the mind to lose connection with the body. 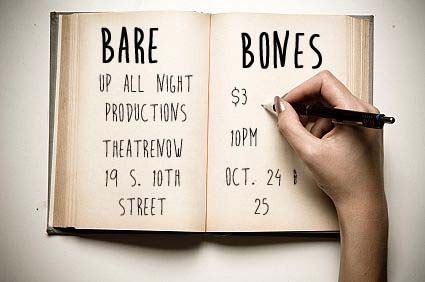 Bare Bones runs October 24th and 25th at 10pm at TheatreNOW. Tickets are $3 at the door. Help Us Make Bare Bones Happen! We’re in rehearsals and getting ready to make our latest production – Bare Bones – happen. But we need YOUR help! Please help donate to make this production a reality and to help raise funds to donate to NEDA, the National Eating Disorders Association! Check out our campaign here to donate!